KUALA LUMPUR/SYDNEY - Malaysia and Australia on Sunday (Dec 23) offered to extend their assistance to Indonesia, a day after a tsunami killed more than 150 people and injured hundreds on the Indonesian islands of Java and Sumatra. Hundreds of homes and other buildings were "heavily damaged" when the tsunami struck along the rim of the Sunda Strait late on Saturday, Indonesia's disaster mitigation agency spokesman Sutopo Purwo Nugroho said. Dozens have been reported missing. Malaysia's Deputy Prime Minister Wan Azizah Wan Ismail said she was "saddened to hear the news of the tsunami disaster", national news agency Bernama reported. "I pray Indonesians will remain strong in facing this test. Malaysia is ready to extend assistance to alleviate the burden of our brothers and sisters in Indonesia," she said to President Joko Widodo in a post on Twitter. Australia's Prime Minister Scott Morrison said the disaster was a "terrible blow for Indonesia", reported the Sydney Morning Herald. "This comes on top of what happened in Sulawesi and so, as always, we're available to support the Indonesian government with these things, as requested," he was quoted saying. He offered his country's help, but said that so far, there had been no requests for assistance and was not expecting any to be made at this time. No Australians had been affected, he said. "We understand that at present there are no foreigners, let alone Australians, who have been impacted by this (disaster)." Successive earthquakes flattened parts of the tourist island of Lombok in August, while a double quake-and-tsunami killed thousands on Sulawesi island in September. 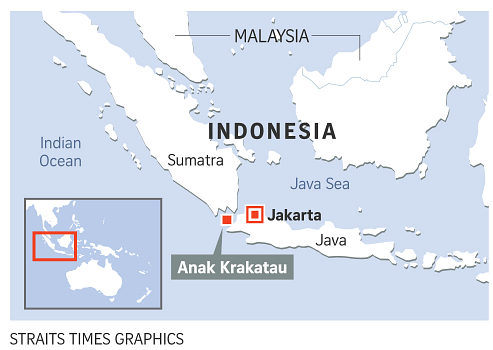 Nearly 200 people also died when a Lion Air passenger plane crashed into the Java Sea in October. On Dec 26 in 2004, an Indian Ocean tsunami triggered by an earthquake killed 226,000 people in 13 countries, including more than 120,000 in Indonesia.